Once you master the airbrush itself, you can create airbrushed nails much faster than you can hand-painted nail art. Airbrushed nails look like they were invented in South Beach, Miami; their abstract, matte designs seem trendy and more artistic than their hand-painted cousins. 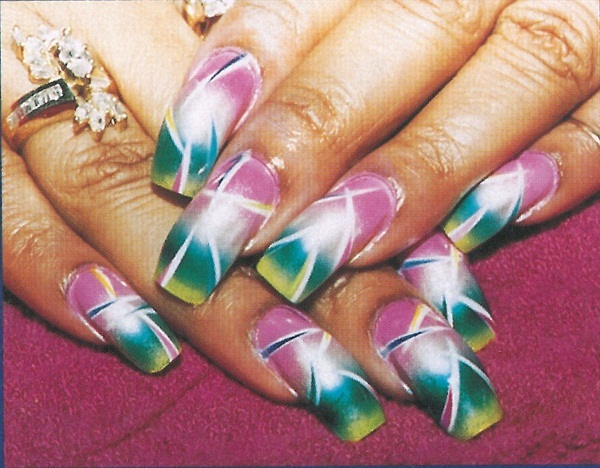 Because coats of airbrushed paint are very thin, the finished nail looks very graphic, or two-dimensional. If you want to add depth for a 3-D effect, you can overlay thin coats of different colors. You should be able to see the different layers of colors on the nail. Once you master the airbrush itself, you can create airbrushed nails much faster than you can hand-painted nail art---a full set usually takes 15-20 minutes. Good airbrushers achieve consistently perfect-looking nails. Learning how to airbrush starts with learning how the equipment works and understanding the dynamics of airbrushing water-based paint. To airbrush, you need an airbrush, an air compressor or air tanks, and air brush paints. You’ll also need to buy cleaner made specially for airbrushes, and you may want to buy stencils. Compressors are loud, but many companies offer “silent” compressors, a necessity in the salon. Suppliers of airbrushing accessories offer a wide range of paint colors and stencils. Pre-made stencils for airbrushing come in a myriad of shapes and sizes that can be combined or customized for wild abstracts and scenic designs. Some nail airbrush artists create their own paint colors. The primary colors (red, yellow, and blue) and white and black can be used to create the colors you need. Airbrushing inherently lends itself to creating a wide range of colors. You can airbrush different shades of the same color and overlay as many other shades as you like to obtain an infinite number of colors. Many airbrushers make their own stencils, edges, and guides. Lynn Montero of Snip & Tip in Redbank, N.J., who typically does 10-13 sets of airbrushed nails a day, uses handmade stencils made from the same plastic commonly used to cover photographs in photo albums. “You can cut any shape you want, but the plastic has a tendency to stretch. You have to be very careful to watch the edges,” Montero says. Other airbrushers use frisket paper, which can be used to mask areas on the nail. Liquid frisket is also available. Another problem eliminated through practice is getting paint on the skin. Kelly McNair, owner of Kiki’s Nail Salon in Toledo, Ohio, uses a cotton-tipped applicator soaked in cleanser to remove paint from around the cuticle, but says that eventually you learn how to use masks and angle the brush so that no pain gets on the cuticle. Airbrushes combine water-based paint and air for a consistent, uniform spray. The paint comes out of the sprayer in very small droplets and dries almost instantly on the nail. This is one reason airbrushing on nails takes so little time. (One technician claims she can produce a set of airbrushed nails in five minutes). The two types of airbrush guns, single and dual-action, can be adjusted to change the volume of paint coming out of the gun. The trigger action further controls how much paint comes out. This is the key: if too much paint is put on the nail, the water in it can’t evaporate, and the paint cracks. Water-based paints are hydrophilic; this means they can absorb moisture from the air. The more humid it is in the salon, the longer it takes for the paint to dry. If too much paint is used or the air is too humid, bubbles can form and the paint won’t adhere well to the nail. If the paint is too wet and you are applying layer upon layer, layers underneath can bleed through and ruin the effect you want. Choosing between a single or dual-action gun is based on personal preference. Montero’s first gun was a single-action model, and she liked it so much she continues to purchase the same kind. Keeping the airbrush clean is very important. After each color application, the brush should be cleaned with airbrush cleaner. Before the gun is put away for the day, it should get a thorough cleaning with airbrush cleaner. If the airbrush should get clogged with paint, you’ll have to dismantle the gun and clean the needle. Montero warns new airbrushers to keep the paint cups clean of debris. “Any foreign object in the paint can cause the gun to clog,” she says. Clients, once exposed to the experience of having airbrushed nails, love them. After trying one or two airbrushed nails, Montero’s clients soon migrate to a full set. Older clients and businesswomen may prefer an airbrushed French manicure with one or two nails having a little extra design, young clients want to go all out with outrageous designs and colors to match their clothes. Nail technicians who airbrush are offering a service that the client can’t get everywhere. Once it’s known that you airbrush, demand for your services may increase, which can boost your income as well. The better you become at this technique, the more you can charge per service. At the same time, you’re developing a style and a talent that enriches your career.